The constellation Perseus is circumpolar, meaning it can be spotted on the night sky all year round. 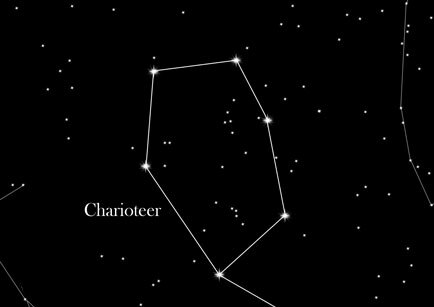 Especially easy to observe in the autumn, when the constellation is high in the sky. When searching for the constellation of Perseus, it is easy to see the Herdsman constellations main star, Capella. Directly to the right of this star you can see Mirphak, the main star of the constellation Perseus. The constellation Perseus is crossed by the center of the Milky Way. It lies east of clearly visible W of Cassiopeia. Starting from Mirphak, distinguished in the sky, the shape of Perseus from his body and a leg. South of Mirphak you can find his flicker quite striking Algol. In the Greek Mythology is the misfortune star "Algol" with his eyes flickering the severed head of Medusa. The story of Perseus is one of the central stories of Greek mythology. The legend has it, that the oracle of Delphi, Acrisius requires that its grandson once will be killed. To prevent this from coming true, Acrisius protected his beautiful daughter Danae in a tower from any outside world. Without success, as Zeus who fell in love with Danae, devised means and ways to satisfy his passion and see her anyway. After a while, Danea actually gave birth to a son, Perseus. Acrisius responded cruel and left them, and Perseus threw them in a box nailed to the sea. The two were stranded on the island of Seriphos, and the years passed. In the end, Perseus married Andromeda and both were given a place of honor in the sky.